That said,I think I see a strawberry blonde in my future. Tall, absolutely – a long neck, quite possibly, comfortable to hold, yes, intoxicating to the senses…..yes, but in moderation – you should never overdo a good thing….I will definitely have to ask my wife for permission…..How will that go over? “Hey Hun, can I brew another beer?” I may be testing the boundaries here….I have a case and a half of Imperial Stout aging, a case of Pumpkin Ale – just a one at a time kind of beer, 6 liters of a honey blonde in my mini keg and about two cases of a session ale that is now drinkable and…..Sunday I am splitting a batch of a Raspberry Wheat Ale with home brewer Mike, “kinda” like an Abita Purple Haze, about 9 L is my share! I think I need to have a party to reduce the inventory before I get an affirmative answer for my efforts! Young Ryan(over 21) has asked for a lesson in crafting beer. Maybe I can work out a deal and kill two birds with one stone here. Hopefully this will work for all involved. Hope he and his crowd of friends will cotton to a Strawberry Blonde Ale. “Craft brewing continues to surge, producing 15% more beer and $1.5 billion more sales. Craft brewing is clearly outpacing the rest of the beer market, producing 15 percent more beer in 2012 than the year before while the total U.S. beer market grew by only 1 percent, according to the annual report released today by the Brewers Association. In total, craft brewers produced 13.2 million barrels in 2012, a 1.8 million barrel increase from 2011. I subscribe to this blog and always learn a little! Check it out! Last night was a sad night for the Irish and confirmation that the SEC dominates college football here in the US. In preparation for the evening I fired up the grill and cooked some chicken breasts. I tend to grill better when enjoying a good beer. My Pumpkin Ale has been conditioning in the bottle for about two weeks now. The temperatures here in Houston have finally dropped to well below room temperature. Since I/we prefer to keep the house cool, the inside temperature has been in the high 50’s….inside the house. We fire up the fireplace in the living area and keep the rest of the house cool. The impact of the cooler temperatures inside the house are not so positive for my beer to condition properly and form carbonation. When I have beer in the fermenter it is an easy fix. I set a big plastic barrel in the room, set the fermenter inside the barrel and partially fill the barrel with water. I then add a fish tank heater set to 68 degrees F. I works very well. Just as I finished bottling the temperatures nose-dived. I hoped for the best but the low temperatures lingered. I didn’t want to chuck all of the bottles into the water barrel so after a week I used a little space heater set on low in the proximity of the cased bottles. I removed one bottle last night before the game, chilled it and was very pleased with the results. Flavor had mellowed nicely from bottling day, carbonation was evident but just a little lacking. I did a little maracas shake with each bottle, placed them back in the cases and I should have dang near perfect beer in less than a week. My friend, Bill shared some of his Helles Lager with me and now I feel comfortable sharing the Pumpkin Ale in return…Ah, life is so good when you have good friends, good beer and a good woman…..I might change that order depending on situation but you get my drift! While my head was on the pillow last night I began to form some thoughts for this posting. I had some really cool thoughts that I planned on using but CRS overtook me. I remember just enough to know that I had the thoughts but they have escaped into lala land. I was tempted to go back into the bedroom and put my head back on the pillow in an attempt to recapture those salient and important thoughts! I thought the better of it, my mountain bike riding friends will remember my “den of the cave bear” comments and understand why I chose to not take the risk! I will always love you Hun! 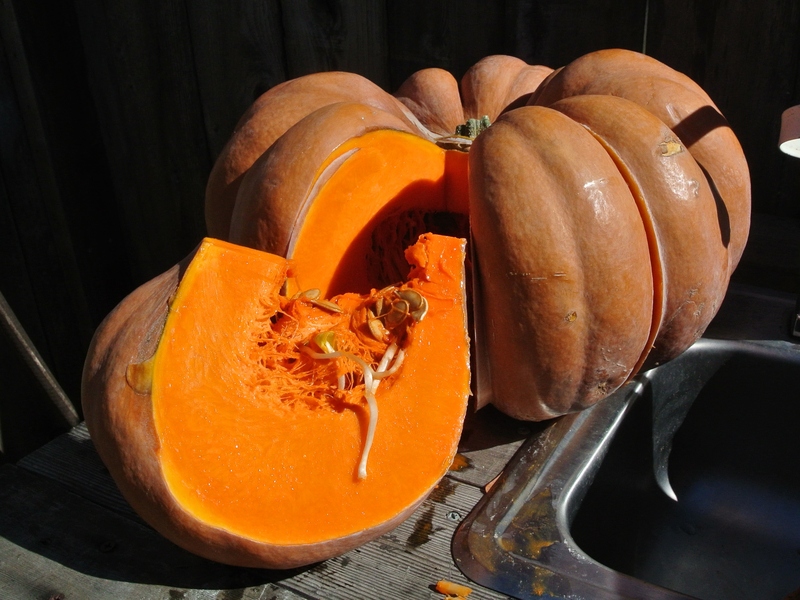 These guys mashed and fermented in real pumpkins……I wasn’t so brave, I roasted the pumpkin, pureed the flesh and steeped it before boiling, adding the malts, hops, spices and irish moss to the wort…..Looks pretty interesting! I may not be brave enough to try it! 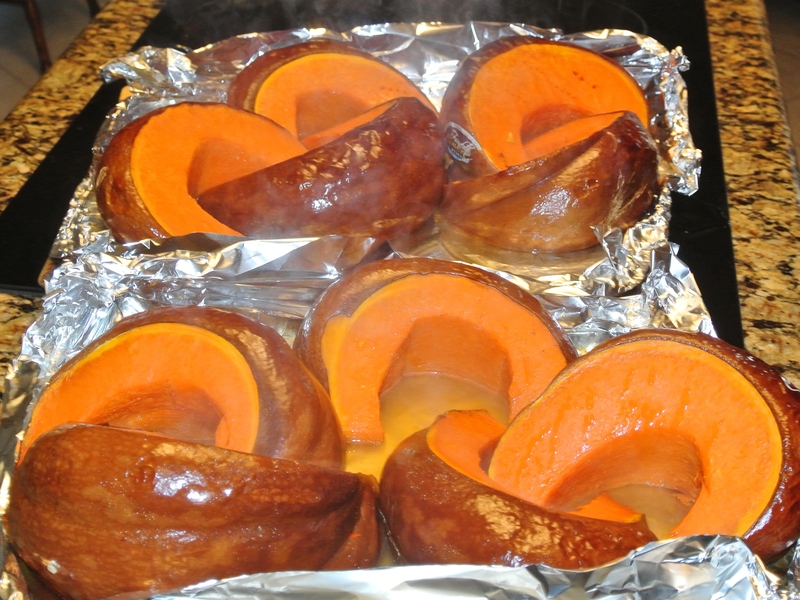 Cutting the pumpkin wedges prior to roasting. The roasted wedges prior to making puree pumpkin. Two days ago I managed to get a window of time and bottle the Pumpkin Ale. The process went smooth…sanitized the kitchen and equipment, kept my hands away from those unsanitary places, no nose picking or scratching the nether lands! One of the simple lessons learned from the local store, Backyard Homebrewers and Education Center, was the use of a misting spray bottle filled with the sanitizer used for the equipment. It comes in very handy. After struggling with the house being warmer than I want for the fermentation period I now struggle with the house being a bit too cool for the conditioning period for the bottled Pumpkin Ale! I may need to get the heating pad out for a few days to get the Ale off to a good start. The sample pulled to check the final gravity was sampled by my son Ben and his good friend Chuck Ciliske. Chuck is a West Point grad in town in order to get married on the 30th! Both young men gave the sample good marks with the comment that the pumpkin flavor was not overwhelming. I agreed as I tossed back the remaining few sips. The final gravity came in at a very nice 1.010….. the calculated ABV should be somewhere around 5%. A nice beer to drink without getting too toasty. I can’t remember if I mentioned sampling the Imperial Stout on Christmas Day? Just a bit of CRS cropping up…..It had been nearly a month since my last taster and the beer is mellowing nicely. I still think the 6 month mark is the target date for sharing with friends. I may set a few bottles back and let them mature for more than a year or so, available for Christmas and New Year’s Eve in 2013. I have one bottle that escaped consumption from my December 2010 batch…..being held for Ben’s graduation from LSU in May of 2013. The only bad beer is no beer! I wrote about frost on the pumpkin this morning for my gardening blog…..a little more philosophical than usual this morning but came on the heals of racking my Pumpkin Ale into the secondary yesterday evening. I should really call it “Cinderella Pumpkin Ale” as it was brewed with fresh pumpkin puree that I prepared from one of my wife’s fall decorative pumpkins. They are usually discarded once the season ends but I chose to make use of at least one of them. Two more are still firm and available for rescue. Back to the ale, it started at about 1.056 original gravity and checked in at 1.015 when I racked it into the carboy(uncorrected gravities). It should be an easy beer to drink at around 5.6% ABV plus or minus a little. I had my oldest son and wife sample the ale from the graduated cylinder and both agree that it is pretty tasty. I want it to clean up pretty well before bottling. There was a good two inches of yeast and puree debris at the bottom of the primary and still a bit cloudy. May let it clean-up until after Christmas before bottling. Last night I was treated to a great evening by my wife…….no, not like that! She bought some tickets for the US Women’s soccer match vs. China here in Houston last night. My daughter and three good friends joined us for some pre-match beers at the Flying Saucer downtown. It always a bit crowded and noisy and we almost could not find a place for the 6 of of us to sit together. The evening chill wasn’t too bad so we grabbed a table out side. Quieter, except when the Metro Train whizzed by on Main St. I added three new beers to my list, tossed the keys to my wife, the DD and off we went to the match. USA, USA, USA was the common chant and we weren’t disappointed. We missed the first 15 or so minutes circling to find a parking spot but arrived just in time to see Abby Wambach put a signature header into the back of the net. She had another unassisted goal in the second half as the US side ran away with a 4-0 win. It was cold enough that the 24 oz. can of Tecate lasted almost the entire match and stayed cold! The Cinderella Pumpkin was huge so I wound up with puree to spare….so , rather than brew 20 gallons of Pumpkin Ale I put some in the freezer and used some to make the Pumpkin bread shown below. Pretty danged good….especially on day two and beyond! It seems that the flavors mature as it site….hmmmmm, kinda like good beer, eh? Yum, very nice. Made two loaves and have plenty to make more!